Supermarket at the junction of South End, Brighton Road, and Selsdon Road. 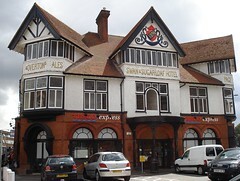 It opened in November 2012 in an ex-pub called the Swan and Sugarloaf (or possibly the Swan and Sugar Loaf). It closed temporarily in early May 2017 due to work taking place elsewhere in the building, but as of 20 May is open again. Existence last checked in May 2017. Last edited 2019-02-07 14:19:36 (version 25; diff). List all versions. Page last edited 2019-02-07 14:19:36 (version 25).